Market is not expecting a bumper qtr like q3 and q2 for q4. I also read somewhere Axis Brokerage has given a negative report. But LT point of view it is at attractive valuation. 15 pe for a stock which has grown EPS @ 53%. See the concall report. They have invested heavily Rs 200 cr last year and Rs 200 cr in pipeline . Spending heavily on R&D. They have said benefits to kick in 2017. Just read and you will appreciate how good they handle questions without any qualms or inhibitions. I think the fears might be more related to the recent USFDA audit which I think got triggered due to impending approval of Warfarin. (I assume Alembic supplies or is going to supply Warfarin to its clients in US and since the client facilities were audited, it triggered Alembic’s audit.— this was the logic provided to me by someone who tracks it very closely) Now there were some very minor observations and markets might be over reacting to these things. According to scuttlebutt, Alembic has filed the responses to these observations and once it gets the USFDA nod, things could get back to normal and Alembic can have a smooth run for next few quarters. But markets tend to over react to positive and negative news and even both perceived and real. Alembic should be disclosing to exchange about the 483 news and the impact. I don’t know why they are taking time for the disclosure. Does that also means that the 483 is not received yet ? I checked aurobindo had similar issue in which bse asked for clarification to which they responded, link below. Lupin did the same thing. When the news was out and blown out of proportion, they gave clarification. but damage was done. Why these companies cannot take proactive steps to inform the investors. 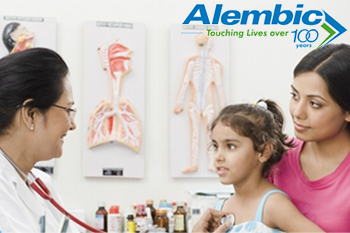 Is anyone aware of the four observations that FDA has made for Alembic Pharma . Are they of serious nature ? Not much available online currently. I think all the possible information about observations is shared upto major extent above. It looks minor to me. As Hiteshji has mentioned earlier probable over reaction by the market, it gives a perfect time window to buy Alembic’s shares. Historically speaking and borrowing Hiteshji’s knowledge, a very good time to buy well performing pharma companies has been when there are some minor observations . I have been nibbling shares very recently at every sharp dip and have managed to double the allocation to the stock. Plan to take a huge bite further, if one of the HFC stock in the portfolio goes up considerably within the same time window. As per this link 4 observations at Taluka plant. The scrip opened at Rs. 565 and has touched a high and low of Rs. 565.95 and Rs. 515.55 respectively. As per the plant locations below Taluka plant seems be the Vadodara bio equivalence plant. Not sure how much revenue contribution it made. One thing good is that panelev plant which is the main formulation plant was not mentioned in the link above for any observation. Does that mean it did not had any observations ? 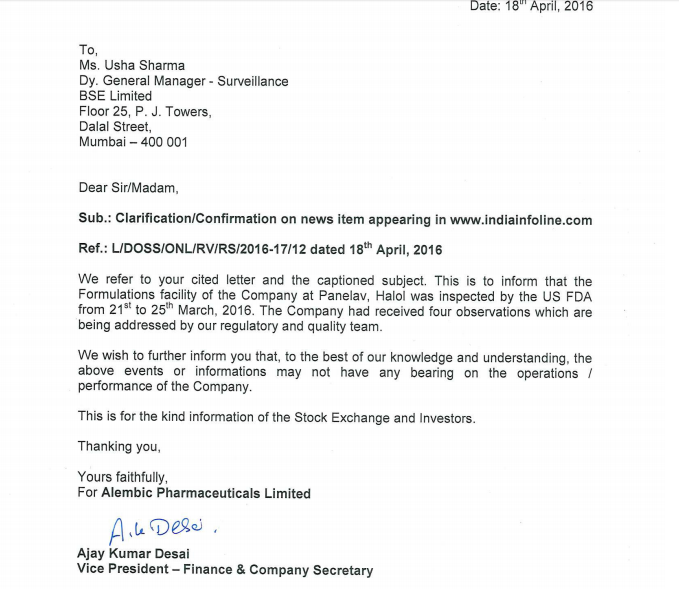 With reference to the news appeared on indiainfoline.com stating, Alembic Pharma tanks 7% US FDA makes four observations, Alembic Pharmaceuticals Ltd has submitted to BSE a copy of Clarification. 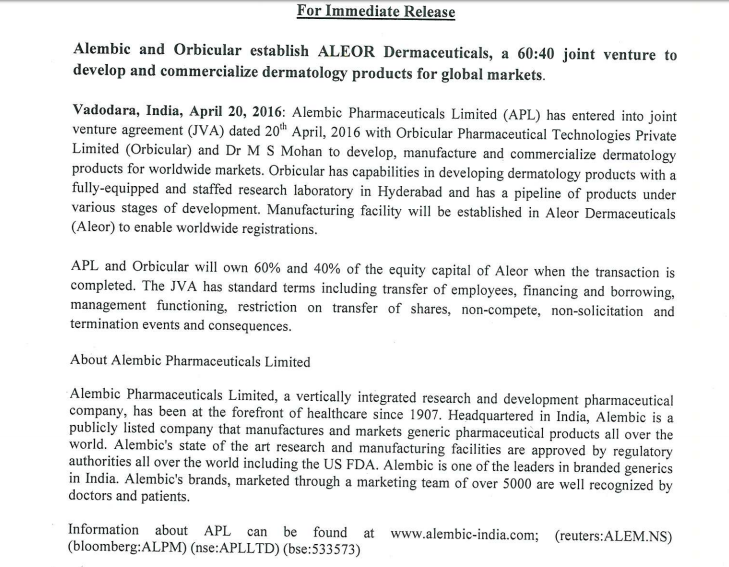 Alembic Pharmaceuticals Ltd has informed BSE regarding a Press Release titled “Alembic and Orbicular establish ALEOR Dermaceuticals, a 60:40 joint venture to develop and commercialize dermatology products for global markets”. gAtacand (CANDESARTAN CILEXETIL, innovator - Astrazeneca) - Patent - Expired (already an expired product). gAtacand is used for treating high blood pressure (hypertension). ANDA Holders (generic formulation already launched) - Apotex, Sandoz, DRL and Mylan (for hydrochloride version). Sales of USD 120 million pre generic. Seems to be a small molecule but even after patent expiry, there are just four players so a limited competition product. gCymbalta (DULOXETINE HYDROCHLORIDE) - the company has already launched the generic for the product and was covered in the excel uploaded earlier. gTarceva (ERLOTINIB HYDROCHLORIDE; innovator - OSI Pharms (marketed by Roche Pharma in US). Exclusivity expiry - November 4, 2016 & patent expiry - November 8, 2018 (generic will be launched on this date). Even Shilpa had filed for its DMF in April, 2015. gTarceva is used to treat non-small cell lung cancer (NSCLC), pancreatic cancer and several other types of cancer. It is a reversible tyrosine kinase inhibitor, which acts on the epidermal growth factor receptor (EGFR). DMF Filers - more than 15 including Natco, Cadila, Hetero, Apotex, MSN. US sales of USD 655 million and worldwide sales of USD 1.29 billion. A big molecule with lot of DMF filers. Should be pretty competitive. Tarceva is used to treat lung cancer. Any treatable cancer cells mutations can be targeted with this drug. This may be the first line of treatment. May be used before chemotherapy. I am not an oncologist but I’d read Paul Kalanithi’s book- When Breath Becomes Air (it is a great read). Unfortunately Paul has lost life to cancer and we can hope to have better quality of drugs to treat them going forward. Disc: I do not own Alembic Pharma. What will happen to profits next year without the Abilify boost? Do they have any more drugs which can make up for this? Disclosure: Invested from lower levels. Seems Q4FY16 is a “normalised” result (ex Abilify windfall gain). Current TTM 16x multiple tells us market is not expecting fireworks on top of FY16 base. In all likelihood, Alembic would march on 20-25% sales and 30-35% earnings CAGR on Q4FY16 base. If a company with ~35% normalised RoCE, ~30% normalised earning growth and ~25% dividend payout deserves ~30x P/E, then sooner than later Alembic Pharma will regain this multiple on its normalised earnings. Also means price movement may be more or less muted in near term. Other blockbuster opportunities is on the table with the kind of pipeline Alembic has. Looking forward to post results conf call notes/transcript (missed dialing in). I was on the call yesterday (and I believe fellow valuepickr Ankit was also on the call). Mr. Baheti the CFO gave 2 separate points which can be used to derive the sales they are internally hoping to achieve in FY17. ----For a different question he mentioned they are expecting R&D as a % of sale to be 14-15% next year. So 450/15% = Rs3000crs. So thankfully even post Abilify boost going away they expect net sales at Rs3000 crs in FY17 (v/s Rs3140crs in FY16) which means some other molecules should kick in. It was also mentioned that they are targetting sales to grow at a CAGR of 25-30% from current levels over next 4 to 5 years. But this growth will be more back ended. They did not seem to worried about the 483s. Another positive observation is that Alembic Pharma does not capitalize R&D (and boost its EPS). Someone told me some companies like Biocon capitalized their R&D costs and amortizes them over longer term. So it looks like in all probability FY17 should she profit decline on higher R&D expenses. So one has to be patient now as short term upside might be capped. Stock is suitable only for long term holders. FDA’s 483 observations are not serious and there were no data integrity issues or management issues. I feel the stock is priced perfectly (maybe on the higher side) at 31 times considering this quarter as base. It would seem that increased R&D spends would start bearing fruits but we don’t know for sure how the future will pan out and straight away cannot expect higher growth. Alembic gets approval for gVimpat (Lacosamide) - https://www.accessdata.fda.gov/scripts/cder/drugsatfda/index.cfm?fuseaction=Search.DrugDetails along with five other players including Sun, Aurobindo, Amneal, Mylan and Actavis. Lacosamide is used for adjunctive treatment of partial-onset seizures and diabetic neuropathic pain. These players will launch the first generic for the drug in the market and seems like shared exclusivity. As per Aurobindo press release - http://corporates.bseindia.com/xml-data/corpfiling/AttachLive/12CF1F5E_CCC8_40D3_9D45_5221641F7350_132729.pdf, Lacosamide had sales of USD 782 million during the past 12 months ended February 2016. It seems to be a growing drug because as per my data based when last check almost a year back, it had sales of USD 593 million. It should be a decent sized opportunity for Alembic given six players in the market. However, it has more significance in a sense that it clears all the rumours regarding the Form 483s issued by USFDA on its last plant visit of formulations unit in March, 2016. Ankit - Is this a final approval or tentative approval ? The fda website is showing it as tentative approval. Your point regarding this approval addressing overhang of recent USFDA 483 is really important and significant. clears all the rumours regarding the Form 483s issued by USFDA on its last plant visit of formulations unit in March, 2016.